« Prostitute Parking Meters! What Will the Germans Tax Next? But this clever Lisa Benson cartoon may be more effective than anything I’ve ever done. IT’S THAT WE JUST DIDN’T SPEND ENOUGH! Brilliant! You and Joe Biden should go on tour. The fact is, Keynesianism is, has always been, and shall always be an abysmal failure. It is propped up by the left for one reason and one reason alone… it offers an academic front to moronic big-government policies that support the leftist agenda. Period. There’s always an excuse for failure… and it’s always someone else’s fault. And when all else fails, go to the classic stand by… “BUT IT WOULD HAVE BEEN SO MUCH WORSE… THEY SAVED US FROM WHAT WOULD HAVE HAPPENED! (and conveniently what can never be proven)”. For a party so hell bent on claiming conservatives can’t accept science, it’s amazing to watch the convulsions you’ll go through to avoid facts, history and evidence when it comes to supporting your failed economic policies. Keynesian economics would have us feed the steaks to the people in the boat so they’d be healthier. It’s a funny cartoon, but it bears no resemblance to any economic ideas, except perhaps the GOP idea that we need to keep sending money from the middle class taxpayers to the filthy rich, and maybe some benefit can be found. on July 28, 2012 at 7:32 pm Donna B. The clever cartoonist is the well-known Lisa Benson. She’s syndicated. Because you never even said her name. Man you sure did debunk an entire field of economics that’s worked for over 20 years without using a single academic papaer. Also DEBT. Here’s my own idea for a cartoon. Mr. Magoo is driving a golf cart and other golfers are diving to get out of his way. The face of Mr. Magoo is Obama. He is completely oblivious to the danger he is causing. He is saying, “Get out of my way, peasants.” Maybe you can think of a better line for him to say. Another thought is that each hole represents a trillion dollars of debt. Holes 17 and 18 haven’t happened yet. china is the biggest keynesian of them all. what do you think all that state lending is. Obama was advised to design a stimulus package of over a trillion dollars but he didn’t think it would pass. It didn’tl reduce employment to five percent but it certainly saved us from the abyss. So don’t blame keynes for Obamas political cowardice and the republican economics ignorance. It just aint so. To Ben Franklin-the cartoon is the result of real world experience, which is not like the fantasy experience your dim brains seem to prefer. Uh, Luis. You do realize that taxes and deficits is the cornerstone of keynsian economics, right? S*U*P*E*R*B joke! The joke is so good that it can be recycled and made it talk about DEFICIT and TAXES!!! Ben Dover: Bend Over! You have been scre**** by Keynes! Keynes General Theory of Employment alleges that when investment tends to become zero then public works tend to create an amount of employment that grows without limit. Your “stimulus” is such a failure that It is even possible that Obama will not be reelected. Already Obama lost congress. And republicans will very probably win both the Senate and the Congress in 2012 (that is what markets clearly signal). 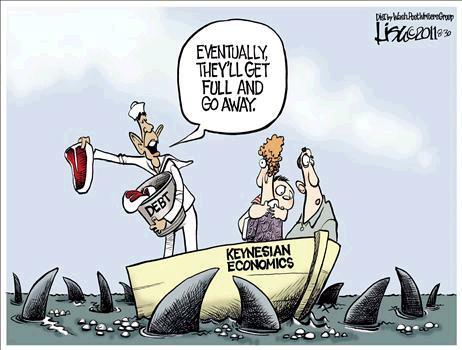 Go on “stimulating” with keynesian nonsense, you will lose political power as Obama already did. Go on aplying bad economic theories, you democrats will become again the party out of power eventough there was a massive crisis in the Bush years that would have allowed you to regain and MAINTAIN political power if you had never engaged in keynesian “big government” nonsense. And look how Western Europe has permanent LOW GROWTH thanks to HEAVY government spending. Read Mr. Dan Mitchell papers and you will see how obvious it is that government spending severely damages growth. Growth in Western Europe usually is a joke, the countries that grow usually are those that reduce taxes, reduce the government, reduce the regulations imposed by the political class or have oil!!! England was a world super power a century ago. Today England as a superpower is a joke thanks to Keynes destructive theories and socialism (socialism means enormous power and control for the political class). Mock it out of existence! Diminish Keynesian ideas to point where only fringe cranks, crackpots and trolls dare legitimately suggest them as policy alternatives. Ben and Franklin. You’ve just proven Darwin wrong, as you are evidently regressing to the swamp. Take this artical and shove it up your a*s.
Sorry, I don’t actually get it. Can you explain the relevance of the cartoon?